Healing Touch for Animals® Practitioners abide by the Healing Touch for Animals® (HTA) Code of Ethics within the Standards of Practice as outlined by Healing Touch for Animals® and Komitor Healing Method, Inc. All care persons and animals are to be respected at all times in accordance with the principle of highest good. Healing Touch for Animals® (HTA) provides care and comfort to an animal through balancing the energy system, while assisting the animal’s physiology to regulate and help the animal to self-heal. HTA is based on a caring relationship between the HTA Practitioner and the care person, to provide the animal with the best energetic support for the animal’s healing process. The HTA Practitioner functions from the HTA Code of Ethics within the HTA Standards of Practice as outlined by Healing Touch for Animals®. All care persons and animals are to be respected at all times. The animal’s needs are to be considered at all times as conveyed by the care person and by the animal’s presentation. An explanation of HTA facilitation to the care person is to be conveyed at the level of the care person’s understanding. The care person’s choices regarding health care for the animal are to be honored. Interventions are based on energetic findings along with the communication from the care person. All facilitation is documented appropriately and is detail-specific to the HTA Practitioner’s background and under the guidelines of HTA practice. Confidentiality of the care person and animal is to be respected at all times and data is stored in such a way as to protect the anonymity of the care person. Data will not be used beyond the caring for the animal unless written permission is obtained by the care person or in the event abuse is detected. Energy facilitation is offered only for the benefit of the animal and in accordance with the principle of highest good and do no harm. HTA Practitioners perform facilitation only with direct permission of the care person of the animal. A cooperative model of healthcare between the veterinarian and the HTA Practitioner is always at the forefront. HTA Practitioners do not diagnose, prescribe medications or perform surgery. HTA Practitioners are to refer care persons to veterinary professionals when appropriate. The HTA Practitioner assumes accountability for his/her actions with conscious intent to facilitate health and well-being for the animal. The HTA Practitioner shall use good judgment regarding application of the HTA therapies. HTA Practitioners provide a safe and clear boundary environment regarding the practitioner and the care person. A professional presence will be presented at all times. HTA Practitioners shall dress in a professionally appropriate manner. A Healing Touch for Animals® (HTA) Practitioner, (defined as anyone who has attended and successfully completed a Level 1 Healing Touch for Animals® Course) may integrate Healing Touch for Animals® within the scope of his/her background. This background is clearly represented to the care person and public in an appropriate manner such as a flyer or brochure outlining the practitioner’s credentials, including the successful completion of approved courses in Healing Touch for Animals® Levels 1, 2, 3 and 4 as taught by Healing Touch for Animals® Certified Instructors through Healing Touch for Animals® and Komitor Healing Method, Inc. HTA Practitioners may not state or print that they are "Certified" or use HTACP initials until the HTA certification process is complete and they hold "Healing Touch for Animals® Certified Practitioner" status. An HTA Practitioner is a resource within his/her community to represent the practice of Healing Touch for Animals® and its relationship to other related individual practitioners, professions, institutions and organizations. The HTA Practitioner provides care and comfort to an animal through balancing the energy system while assisting the animal’s physiology to regulate and help the animal to self-heal. The HTA Practitioner has a pure and clear intention for the highest healing good of the animal. During Healing Touch for Animals® Treatment Sessions, the HTA Practitioner gives an explanation regarding the details of the energetic treatment based on the energy assessment. The animal’s care person is a fully knowledgeable participant in the health/healing process. 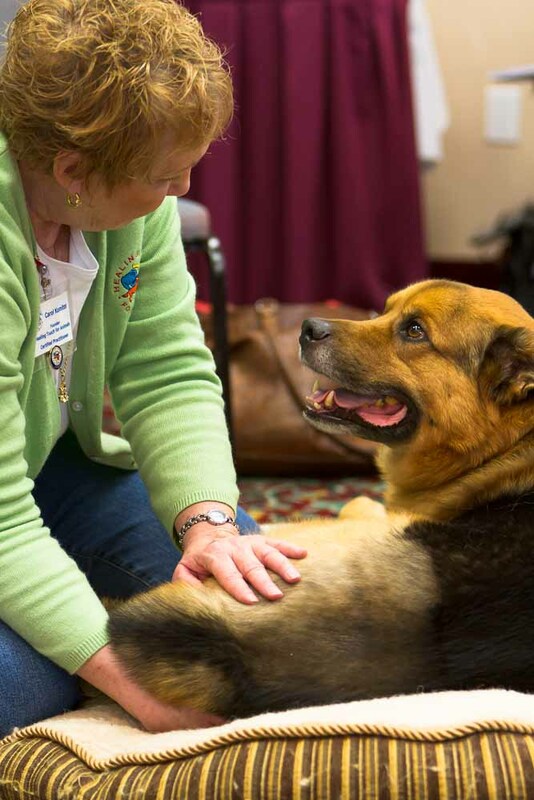 The HTA Practitioner provides a safe and comfortable area for the Healing Touch for Animals® sessions and an empowering and supportive environment for the care person. Any treatment given using Healing Touch for Animals® Techniques is based on the animal’s individual need and established from the assessment of the energy system as outlined in the Healing Touch for Animals® Workbooks, Levels 1-4 published by Healing Touch for Animals® and Komitor Healing Method, Inc.
After the treatment, the energy system is reassessed to determine the effect of the treatment and need for further treatment of the energy system and/or referral. All facilitation is documented appropriately and is detail-specific to the HTA Practitioner’s background and under the guidelines of HTA practice. Confidentiality of the care person and animal is respected at all times and data is stored in such a way as to protect their anonymity. This data will not be used beyond the caring for the animal unless written permission is obtained from the care person. A cooperative model of healthcare between the veterinarian and the Healing Touch for Animals® Practitioner is always at the forefront. HTA Practitioners practice within the scope of their background, training, knowledge and experience. HTA Practitioners do not diagnose, prescribe medications, perform surgery or interfere with the treatment of a licensed veterinary professional, unless the HTA Practitioner is a licensed veterinarian. HTA Practitioners refer to the care person’s veterinary professionals when appropriate. HTA Practitioners are committed to quality care and leadership. This requires a commitment to operate from the Healing Touch for Animals® Code of Ethics. HTA Practitioners are required by law to report evidence of animal abuse. "HTA Practitioners", (defined as any HTA Student) and/or "HTA Certified Practitioners" (defined as an individual having met the requirements of the HTA Certification Program) will protect the registered trademarks, trade names, copyright information, and all intellectual properties by not reproducing the images and / or wording generated by Healing Touch for Animals®. Healing Touch for Animals® materials and/or teaching may not be used with any other program and/or teachings without prior written consent by Healing Touch for Animals®. HTA Practitioners may not state or print that they are "Certified" or use HTACP initials until the HTA certification process is complete and they hold "Healing Touch for Animals® Certified Practitioner" status. "HTA Practitioner" status, (defined as any HTA Student), and/or "HTA Certified Practitioner" status (defined as an individual having met the requirements of the HTA Certification Program) does not establish an agency, joint venture, or employer/employee relationship between HTA and the HTA Practitioner and/or HTA Certified Practitioner. HTA Practitioners and/or HTA Certified Practitioners are independent and are not a spokesperson, legal representative, or employee of HTA. HTA Practitioners and/or HTA Certified Practitioners can not obligate or otherwise bind HTA to any agreement or duty. HTA Practitioners and/or HTA Certified Practitioners shall not be treated as an employee, agent, franchise, joint venture, partner, or owner of HTA for federal tax purposes. HTA Practitioners and/or HTA Certified Practitioners will assume the responsibility for all taxes coming due or arising from his/her activities as an HTA Practitioner and/or HTA Certified Practitioner, including, but not limited to, sales tax, state and federal income tax, FICA, Medicare withholdings, and unemployment tax. HTA Practitioners and/or HTA Certified Practitioners indemnifies and agrees to hold harmless HTA, its officers, directors, employees, and agents against any liability, claims, obligations, expenses (including attorney fees), or other damages. "HTA Practitioners" and/or "HTA Certified Practitioners" agree to uphold the integrity and professionalism of Healing Touch for Animals® / Komitor Healing Method, Inc. (HTA/KHM) and agree to not use or claim ownership of any works or claims of creation of said material. The Healing Touch for Animals® Standards of Practice, Code of Ethics, and Practitioner Policy are provided to the public at large.